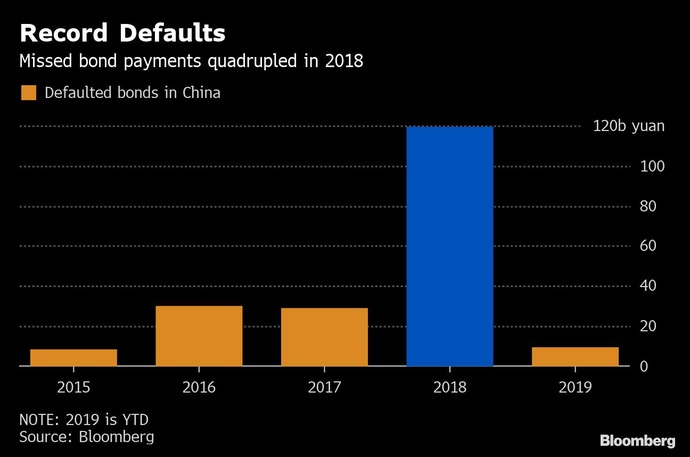 (Bloomberg) -- Two large Chinese borrowers - one that's already defaulted, and one that's under pressure -- missed payment deadlines this month, underscoring the risks piling up in a credit market that's witnessing the most company failures on record. "Chinese corporations' expansion in the past few years has often been fueled by debt issuance, usually short-term borrowings, but their investment cycles are typically longer term," said Shen Chen, a partner at Shanghai Maoliang Investment Management LLP. "The recent failures show that companies are still struggling to roll over their debt despite the recent easing measures." Shanghai-based China Minsheng Investment didn't repay investors in a 3 billion yuan bond that matured Jan. 29, then pledged to give them their money back three days late, Bloomberg News reported earlier. But that didn't happen, the people familiar with the matter said. China's financial markets were shut last week for the lunar new year holidays, and calls to China Minsheng Investment's financing manager went unanswered on Monday. Meanwhile, Wintime Energy told investors that it's still seeking financing to repay 20 percent of the principal on a 3.8 billion yuan delinquent bond, which was meant to be returned on Feb. 6, said other people familiar with the matter, asking not to be named as the information is private. The yield spread on five-year AA- rated notes (considered a junk score in China) is still more than 300 basis points over top-rated peers, more than twice the level of a year earlier, according to ChinaBond data. The "market is clearly pricing in a lot of credit differentiation as access to refinance remains firmly shut for certain issuers yet widely open for others," said Anne Zhang, executive director for fixed income, currencies and commodities at JPMorgan Private Bank. "Defaults will become more frequent yet more idiosyncratic." --With assistance from Ina Zhou. The Saudis are closely monitoring oil-market developments after the U.S. announcement regarding export sanctions on Iran, Al-Falih said in a statement. @JohnKerry and people who helped him lead the U.S. into the very bad Iran Nuclear Deal. Any nation continuing to buy Iranian oil will face U.S. sanctions, Secretary of State Michael Pompeo said Monday after announcing that temporary waivers granted to some nations late last year won't be renewed when they expire next month.